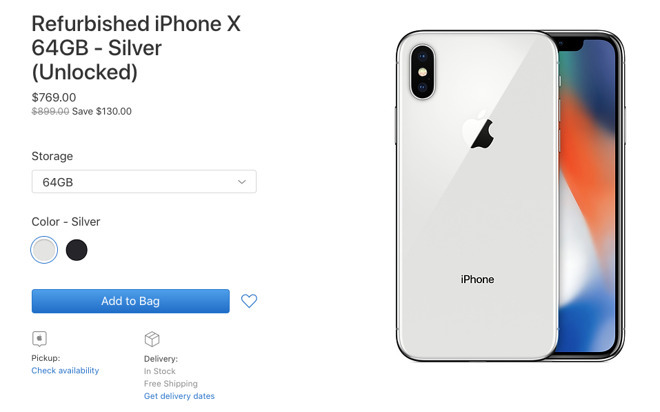 Appearing through the company’s refurbished section of the online Apple Store, the iPhone X is being offered as an unlocked device, having passed through Apple’s process. Models are offered packed in a brand new white box, a new battery and outer shell, and a one-year warranty, the same as a brand new iPhone. According to the store’s pricing, the 64-gigabyte model is being sold for $769, effectively $230 off the original sale price for the model at launch, while the 256-gigabyte capacity variant is on sale for $899, itself a savings of $230 from the $1,149 launch price. Both models are also offered in Space Gray and Silver variants. For comparison, the lowest-capacity iPhone XR model at 64 gigabytes sells for $749, $20 less than the pre-owned iPhone X. For the 256-gigabyte capacity model, the iPhone XR costs $899, the same as the used iPhone X following Apple’s refurbishment.